with Sarah Conley Odenkirk, Esq. Sign up to attend a session designed for new and experienced lawyers wanting to learn more about the intricacies of art world contracts. This program will focus on specific differences found in art-related contracts as well as touching on alternative dispute resolution for creative disputes. Together we will explore this exclusive area of the law and at the end of the session, you will be ready to take on your next art world transaction with confidence! An artist in today’s market has a few different options available for monetizing artistic product. Together, we’ll briefly look at licensing deals, go in-depth into consignment deals, and discuss private commissions. Then we’ll discuss ways artists can avoid and resolve disputes. Highly recommended for California Lawyers for the Arts member attorneys and those interested in joining our pro bono referral panel. Students, artists, and business owners are also welcome to attend. Sarah Conley Odenkirk is a fine art attorney in Los Angeles, California. She maintains a private legal practice and is also on the faculty of the Sotheby’s Art Institute’s MA in Art Business at Claremont Graduate University. Sarah is a Council Member for American’s for the Arts’ Public Art Network, and on the Director’s Council for UCLA’s Fowler Museum. She is the author of A Surprisingly Interesting Book About Contracts and maintains a database containing executive summaries and underlying documentation for public art in private development policies and ordinances nationwide. Sarah is admitted to practice in California, New York, Oregon, District of Columbia and Washington. She is also fluent in French. 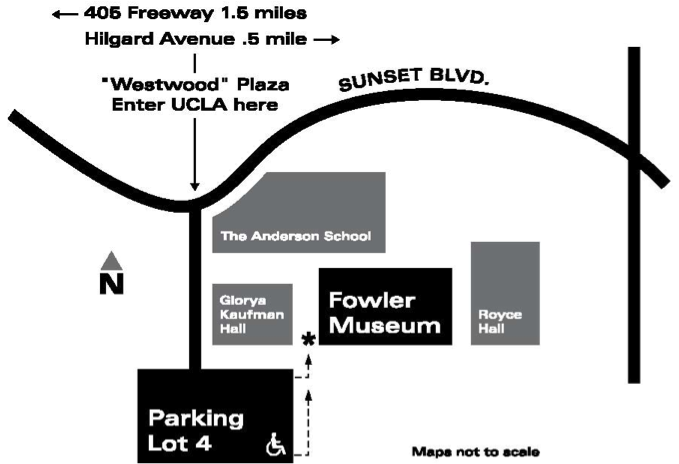 Enter the UCLA campus only from the north main entrance, at the intersection of Westwood Plaza and Sunset Boulevard (the overhead street sign at the intersection reads “Westwood”). This entrance is one-and-a-half miles east of the 405 (San Diego) Freeway, and one-half mile west of Hilgard Avenue. Once you have entered the campus, drive directly ahead and into underground Parking Lot 4.There is an elevator at the southeast end of Lot 4, with handicapped parking adjacent. A stairwell at the northeast end is closest to the Museum’s main entrance.